Heat inside an enclosure can decrease life expectancy in controlling units such as PLCs, HMI, and AC drives. Excessive heat can cause nuisance faults from electrical and electronic components, circuit breakers and fuses. To help alleviate such problems, AutomationDirect is now offering NEMA-rated Stratus air conditioners for enclosures. NEMA-rated Stratus air conditioners for enclosures. These closed-loop cooling systems are recommended for harsh environments, or when there are washdown requirements, heavy dust and debris, or airborne chemicals present. Available in 120V and 230V units, the NEMA 12, 4 and 4X-frame Stratus 1,000 to 8,000 BTU/H air conditioners feature free-standing rigid chassis for easy installation and maintenance. NEMA 12 and 4 models are constructed of 16-gauge cold rolled steel; NEMA 4X units consist of 16-gauge 304 stainless steel. All units contain an active condensate management system and protective-coated condenser coils. Designed to fit enclosures as shallow as 12 inches, each unit features a digital LED temperature controller with visible alarm and is pre-wired for external alarm monitoring. The highly energy-efficient compressors have CFC-free refrigerant and come equipped with anti short-cycle protection. All models are UL and cUL listed. Prices start at $1,099. Replacement filters are also available for each of the three frame sizes, starting at $24. 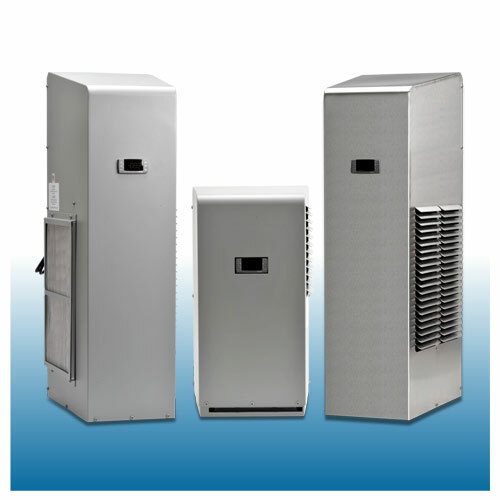 Click here to see the full line of Stratus enclosure air conditioners.